Recently, Danielle sat down with Debbie Thompson from ForeverLawn to discuss how her company has helped shape the landscape of lawns across the North and Central Georgia areas. ForeverLawn of North Central Georgia transforms a tired yard into a landscaped paradise that looks lush year-round. Imagine, no more watering, mowing, fertilizing, sodding, or mud tracked indoors on rainy days. What prompted your start in the synthetic lawn business? DT: For as long as I can remember I’ve had an entrepreneurial spirit. I was investing much of my time and capital into the real estate market. When you spend any significant portion of time in helping others find a home or space, you get an idea of what matters to clients. You quickly realize the commitment and appreciation of attractive landscaping. In Georgia, frequent droughts and the resulting water restrictions force homeowners to find alternative practices. One such practice that continually popped up was the “spraying” of lawns to maintain color and appearance. As a result, I began investigating the artificial lawn business. What you realize is that there are vendors out there but finding a quality product is essential. After seeing the premium quality of ForeverLawn grasses, I knew that was the way I wanted to steer my company. The strength of the product, tied with our family-oriented ethics, and the boutique nature of the company made this a win-win-win for us. You mention the strength of the ForeverLawn products. What type of products are included in the mix that ForeverLawn offers? DT: We cover the gamet, from residential to commercial to K9, and playground products. The Residential line features a variety of grass blade lengths. Our premium product is the version with the longest blades. 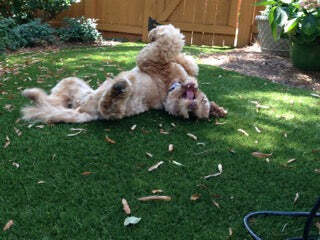 ForeverLawn was the first to synthetic lawn company to develop K9 grass. The product does not stain or discolor, and has microbial properties that consists of a short blade with knitted backing. This characteristic allows for pet waste to pass through the grass unimpeded. If needed, the K9 product can be disinfected, something that is close to impossible with both pea gravel and mulch. Our Playground turf is manufactured to take more abuse than a football field. There is a padded safety system built into the turn rated for various fall heights. Antimicrobial and antistatic properties are also standard. The Commercial applications fit the bill for golf greens and other sporting turfs. How are ForeverLawn products superior to other synthetic turfs? DT: All ForeverLawn products are manufactured with a three-layer backing system, which does not require a lot of infill. The products are structurally heavy, which helps keep the product from moving or shifting. The blades are encapsulated within the backing, maximizing the structural integrity of the product. Unlike live turf, which battles the struggle of the seasons, ForeverLawn turf has a life expectancy of anywhere from 15-20 years. DuPont ForeverLawn® Select Synthetic Grass has taken realism to a new level. This innovative line of fine-bladed, lush synthetic turf features a tan thatch to enhance the natural grass appearance. Ideal for residential and commercial landscaping, DuPont ForeverLawn® Select Synthetic Grass offers durable blades and dense construction. Want more information about ForeverLawn?